VISIONS OF THE NORTH: Artifacts from HMS "Erebus"
After waiting many weeks for news of the results of the ice-dive last month to HMS "Erebus," those of us with a longstanding interest in the Franklin expedition were, once again, caught be surprise, this time by a pop-up exhibition at the Canadian Museum of History. In a press release announcing this event, Parks Canada and the Canadian government gave a brief account of the dive, and mentioned specific artifacts which had been brought to the surface for conservation: one of the six-pounder bronze cannons, several of the rectangular deck prisms, the Preston patent illuminators, as well as personal items including a medicine bottle, china plates, and buttons identified as coming from a Royal Marine uniform. The report concluded by indicating that all of these items would be undergoing a period of conservation. The philosophy behind this new exhibit seems to be to get everything on display as quickly as possible, which for some items means while they are still in the process of being conserved. And while there's nothing wrong with that -- in fact it's quite exciting! -- the haste with which the exhibit has been mounted has left many questions unanswered: From what part of the ships, or the debris, did these items come? The cannon, we are told, was found on the deck, but as to the others, it's hard to say from what has appeared so far. Why were the illuminators, which might be thought of as integral parts of the vessel, removed? The china plates (of which more anon), were these found in the vicinity of the sailors' mess, or did they turn up in the debris field? Some of the items mentioned do not yet seem to be part of the display; might there be others? How far into the wreck were the divers able to go? Will we be getting more imagery soon? There are many goals that can be met with a museum exhibit. In terms of "revealing" some aspects of everyday life aboard ship, the plates are standouts -- one a an 1840's-era Whampoa Blue Ironstone plate with the "Island Pagoda" pattern, the other the quite common Staffordshire "willow" pattern still made today, suggest that those who ate from them may have come from somewhat different social classes. One can also see one of the illuminators which brought daylight -- when there was any -- below decks, and a hook block with its distinctive shape. 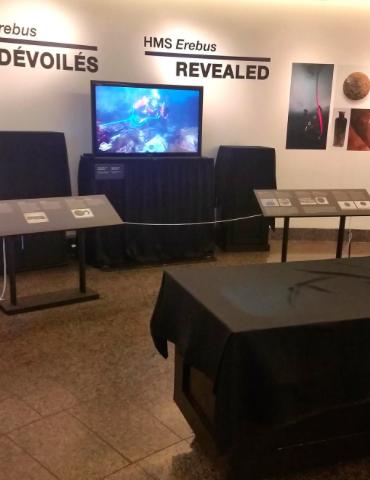 It's quite fascinating, but while it sheds some light on a few aspects of "Erebus," the exhibit doesn't appear to address the question of what the ship's condition or contents can tell us about the fate of Franklin's men. Was it piloted to the location, or did it drift there? How many of the ship's anchors are accounted for, and is there any sign of their deliberate deployment? It may just be a bit too early to address these questions, or to bring more context into these seemingly disparate objects. Still, in their form and substance, they have a unique power to evoke the lives of the men who used them, as well as giving us a strong sense of how much more still lies below the icy waters of the Arctic. UPDATE: Parks Canada's web exhibit of these artifacts is now online! The "Erebus" artifacts recovered will of course become more numerous over time, and I think it will be interesting to compare/contrast them with what was brought away by Franklin's men during their bid for safety, and later found by searchers. Glenn, agreed ... these items are likely just the 'tip of the iceberg'! -- Inuit testimony does describe numerous tin plates"being found at the Boat Places on King William Island, so we can probably deduce that they left their good china behind for a lighter-weight alternative. The "Whampoa" china is particularly evocative as we know that many of the officers had recently returned from participation in the "Opium Wars" before embarking for the arctic. As well as some of the sailors/Marines, Dave. In fact, the campaign medal for that conflict (China Medal 1840-42) was not issued to the RN and RM until after the departure of the Franklin Expedition. Consequently, it was issued to some of those entitled only after they were officially declared dead. That is to say, the medal was issued to the next-of-kin after the intended recipients were officially declared dead. After the video tour of the ship several weeks ago, it seems it all went silent. Parks Canada was quiet about whether artifacts had been recovered.......but it gave me hope that something had been, and so it has. I wondered why removed the glass illuminators and the magnifier. Was it to gain access for the divers??? If so....what did they find there? Are more objects presently being conserved? Or, is this "it" for now? Where in the ship were the objects found? Some context would help, though I'm sure it will come over time. I must admit I was hoping for the "Franklin's Private Journal" to be unveiled.....maybe that is next week's offering?? ?